When looking back on the PlayStation VR’s lifespan thus far, it’s hard to shake the feeling that something’s missing. There are over 100 titles on the platform, yet I couldn’t point to a single VR exclusive that expounds on the functionality enough to graduate from lengthy tech demos to full-fledged release. This is why I had high hopes for the recently released Apex Construct. Set in a futuristic world where you are the lone surviving representative of humanity, the proposition of exploring a technological ghost town sounded extremely captivating. Can it manage to transcend the shackles of the headset, or will it end up being derailed before immersion fully sets in? You know what I love in games? A disembodied voice. Seriously. I genuinely cannot get enough of it. I loved it in The Stanley Parable, Bastion, BioShock, and the Portal franchise. If done right, there’s just something about being told what to do that makes you want to, well, do what you’re told. Luckily for me, Apex Construct is also intent on quieting the voices in my head by providing one of their own. The voice of Fathr (and yes, that is the proper spelling of his name) is what introduces you to this high-tech wasteland and guides you throughout the campaign. He frequently bares the heavy load of delivering an overflowing bowl of narrative soup, in a way that is both pleasant and palatable. As reassuring as his voice may be, don’t let the somber, almost crestfallen delivery lull you into a false sense of security. Things aren’t always what they seem. Armed with a robotic hand, the player is immediately dispatched by Fathr to find a way back to the safe house. According to him, it’s the only location where everyone is truly safe. But what exactly is worth avoiding in this post-apocalyptic wasteland, you ask? Robots. Seemingly endless waves of big friggin’ robots. Although it doesn’t necessarily sound intimidating, try to picture a robotic turkey, complete with fully puffed plumage. Now imagine that this odd animatronic poultry can traverse the terrain with a strafing action that could only be accomplished thanks to its arachnoid-esque lower torso and legs. This nightmare beast is then topped off with mounted cannons that are placed roughly where this “death turkey’s” wings would normally be. And that’s only the first nightmare creature that Apex throws at players. So with that mental picture of enemies so effectively painted, you can only imagine that self-defense is a critical aspect of the gameplay. Players fend off a multitude of different beasts using their handy combination of bow and arrow. In addition to the traditional offensive purposes of this weapon, the bow also has the ability to project a shield for a short time. Once the defense has been either depleted or crossed the maximum damage threshold, the field will drop for a time while it recharges. Of course, it would be impossible to utilize such a weapon combination without the mandatory use of two PlayStation Move controllers. The digital ice cream cones also double as the way players will actually traverse the world. Using the bow hand, which is interchangeable depending upon preference, a position indicator can be both placed and moved around the environment. As soon as the button is released, the camera jumps over to the highlighted location. The draw hand is used to rotate the camera either 180 degrees or a series of gesture-driven minor rotations. Navigation may prove to be a bit unwieldy at first, but it doesn’t take long before the gestures become damn near second nature. At first, the campaign feels surprisingly sprawling and expansive. Each of the available maps feature plenty of secrets to uncover, including a series of puzzles that must be completed in order to fully explore every nook and cranny. Repeat visits are actually needed in order to access areas that are walled off behind ability and keycard walls. I initially assumed that these blocked off areas were meant to be Easter eggs, designed to encourage replayability. Only later did their true and far more nefarious purpose come to light. But more on that later. 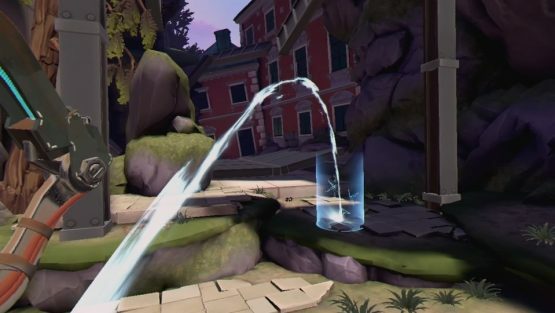 Anyone who has attempted any sort of VR or PlayStation Move archery experience should have a pretty good idea what to expect from the combat. The only major difference is that targets both move and fire back. It’s important to be quick when drawing the shield and to perfect this tactic early. Possessing effective defensive skills are critical at later junctures in the campaign. Eventually newer robotic enemies will be introduced, along with enhanced shielding for the units that were already loathsome enough. In order to combat the adversarial progression of technology, a pair of additional arrow varieties are eventually introduced. These projectiles are in a much more limited supply and have uses both in and out of combat. For example, the electrically charged dart can be used on the battlefield to temporarily drop the shield of especially pesky units. These same barbs can spark certain buttons back to life, which in turn opens up new areas for exploration. As much fun as it is to explore every inch of Apex Construct’s world, the content that I originally assumed was for replayability actually served the exact opposite purpose. Despite the mission selection map showing completely different locations for each assignment, quite frequently the campaign forces you to replay through locales that have already been completed. That walled off area was actually something that you have to revisit in order to progress. Though enemies are placed in different locations on a second visit, it still doesn’t change the fact that it’s a cheap tactic to pad out the run-time. This is a game about exploration. If I have to trudge my way through the same area again, suddenly the hassle of increasingly challenging combat almost doesn’t seem worth it. Speaking of difficulty, boy howdy does the AI have some serious teeth. I found myself having to replay sections numerous times, with each respawn resulting in a slightly more boiling rage. Thankfully the fury would subside once a tough area was cleared. An encounter may have been challenging, but hot damn did it make success all the more satisfying. Despite its good points, there was still one key design decision that never made much sense: object permanence. Even though the game offered a very generous checkpoint system, the respawning process never bothers to reset items and consumables. Death doesn’t seem so bad when you know there’s a health pack on the ground for your next attempt. However, if you use the health pack during one respawn, from that point forward the same health boost respawns in a consumed state. So let me get this straight; I have to fight all of the same enemies again, but the obviously crucial item can only be used once EVER? Call me crazy, but that doesn’t make a damn bit of sense! Even with the occasional boneheaded design choice, there’s still so much that Apex Construct does right. The absorbing level design, outstanding voice acting, and competitive combat all prove to be fantastic uses of PlayStation VR. Ultimately, the game feels like a very promising glimpse into the potential future of the platform. Even with its wrinkles, this adventure exemplifies what VR experiences could be on PlayStation. Apex Construct review code provided by publisher. 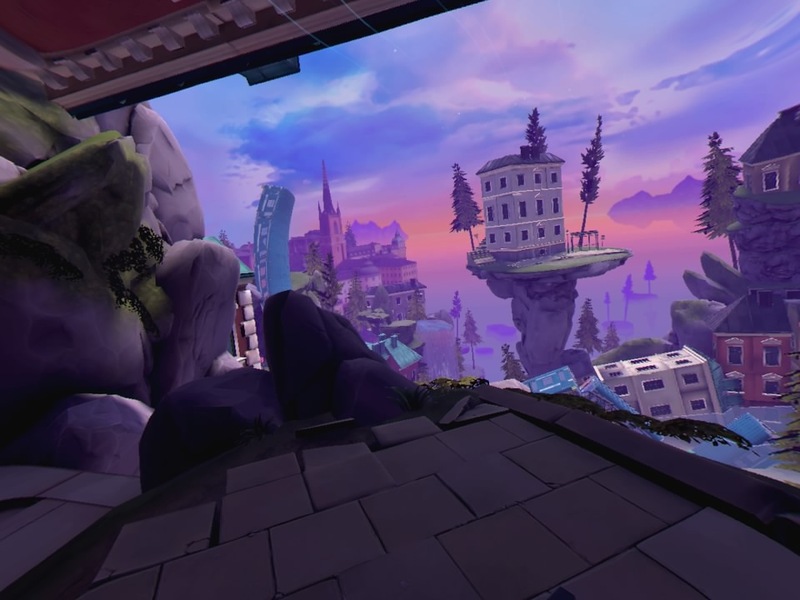 Version 1.0 reviewed on a standard PlayStation 4 utilizing a PlayStation VR. For more information on scoring please see our Review Policy here.